The scariest thing that you are likely to see on an average day in Shoreditch usually consists of obscure leather furniture, or super cool hipsters armed with NHS glasses and skinny jeans, listening to tunes from bands that don’t even exist yet. However, as email warnings spread that Britain was experiencing a zombie outbreak spread over the internet, a gaggle of game journos and Resident Evil fans were instructed to download the Zombie Hunt app. They were now tasked with cleaning the streets of zombies, not hipsters (maybe that comes later?). Outside the Bells of Shoreditch, a wounded female Umbrella trooper guarded the entrance, blood oozing from a gash in her neck. The trooper ushered groups into a dark smoky room with flashing warning lights and sirens. Military soldiers shout, asking the group if they had downloaded the app and if they were prepared to face zombies. Umbrella Special Forces badges were issued and the team were told to rest before their mission. Whilst watching a video briefing from Umbrella HQ, a scientist explained how we can kill the zombies, a U.S.S. officer runs into the room, bleeding from the face, screaming that the infected had overrun their positions and the team must start their mission now! An injured U.S.S. officer is found lying in the road, shouting that he is ‘friendly’ and that he has important information, handing the team a code. This was key to destroying vital evidence. It wasn’t all about killing augmented reality zombies with a mobile app though; the team encountered a real zombie in a church yard. Using the code acquired earlier, the zombie slayers followed a soldier through an apartment building, complete with smoke billowing out from underneath. Inside amongst the smoke and laser beams, a scientist shouts out for help, holding his guts and intestines. The team is asked to enter the code into the laptop and delete the files on the computer before the scientist ‘turns’. Anyone that has played a Resident Evil game knows when that happens, you need to get the hell out of dodge. Back at HQ, the guard informs the team that the infected have taken over and that there are zombies inside. A liver hangs from the gate. 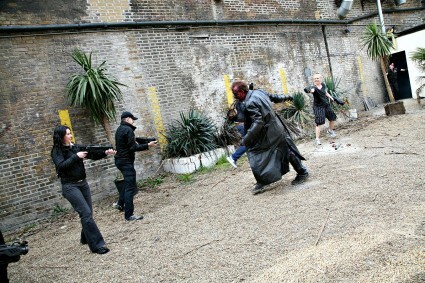 The team is issued with guns and forced into a courtyard where the group shoot at zombies, infected U.S.S. troops and Special Forces before being ushered inside. Inside is pitch black, until strobe lights fill the room and a towering Tyrant runs towards the group. A door opens and the team dive through it to get back into the briefing room. A computer screen shows an Umbrella official,who reveals that the team has been double crossed and a nuclear strike was heading their way! That signalled the end of the zombie mission, but on the way out, the teams are invited to play Operation Raccoon city on several rows of consoles. Umbrella officials prowled around supervising play. Gaming events that offer journos or fans a sneak peek of new releases are seldom as glamorous or as exciting as many people think, but the time and effort put in by the guys at Capcom offered something completely refreshing and unique and we can only applaud them for that. As for the game, Operation Raccoon City, you can read our full review here. Rest assured that while the scenesters have now returned to Shoreditch, I can at least recommend that a refreshing Red Stripe at the Three Blind Mice Bar is the perfect way to finish a hard day of zombie killing.